Recently, Tiffany of IHeartArt and I were trying to give each other a little help on how to be better card makers. I really like and respect Tiffany as a person and as a friend so it was easy to trust her and I knew that nothing she said would be mean or hurtful. In this card, I'm trying to tackle a couple of the issues that Tiffany and I talked about. I'm always saying how much I like texture and dimension in other people's cards. I think it's because those are things I am lacking in my own cards. So, here's my shot at trying to get a little better. I popped the tree up on some Pop Dots. Though I HATE the way the card looks from the side, since Pop Dots are really thick, the front of the card is pretty. I used the dew drops for more dimension. And for texture, I used this AMAZING Amy Butler paper that my good friend Jenny Bunny kindly gave to me. This is for Laura's Sketch 8 over at 2 Sketches 4 You. You got the eco chic!!!!!! I love this card! That paper is perfect for the tree image! Thank you for trusting me :) We're stamp twins---that's what I'm here for! Talk to you later! Ashley you did an INCREDIBLE job! 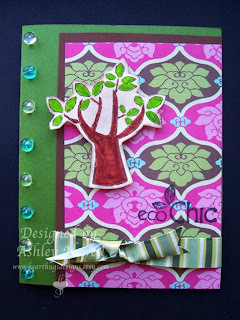 Love this card -- the tree does POP and I love those little dew drops. I need to get some of those! Oh, hey, we use the same paper...great minds right? Beautiful card, I love the dew drops. Totally love that tree and sentiment! That paper is great with this!! Lovely card, great colours and I love the little jewels.